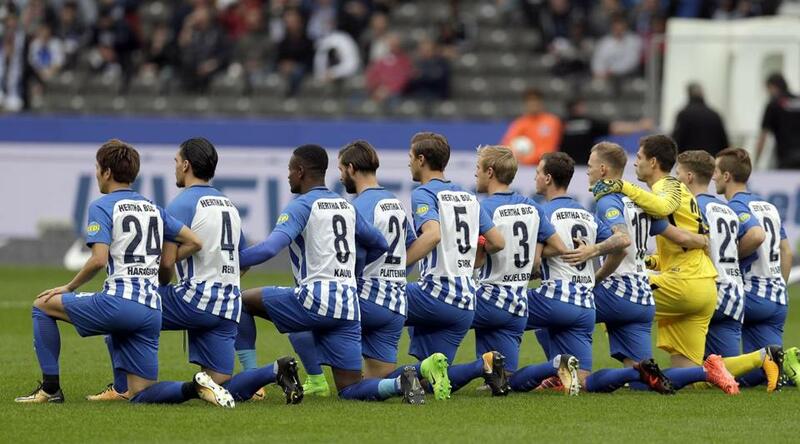 Players of Berlin took a kneee prior to the German Bundesliga soccer match between Hertha BSC Berlin and FC Schalke in Berlin. BERLIN (AP) — Hertha Berlin nodded to social struggles in the United States by kneeling before its Bundesliga home game on Saturday. ‘‘We wanted to make a stand against racism,’’ Hertha captain Per Skjelbred said after their 2-0 loss to Schalke. ‘‘Hertha BSC stands for tolerance and responsibility! For a tolerant Berlin and an open-minded world, now and forevermore!’’ the club said on Twitter. ‘‘Hertha Berlin stands for diversity and against violence. For this reason we are joining the protest of American athletes and setting a sign against discrimination,’’ the stadium announcer told more than 50,000 fans attending the game at Berlin’s Olympiastadion, originally built for the 1936 Olympics in Nazi Germany. ‘‘We stand against racists and that’s our way of sharing that. We are always going to fight against this kind of behavior, as a team and as a city,’’ said Kalou, who acknowledged the action was inspired by the American athletes’ protest against discrimination. ‘‘It shouldn’t exist in any kind of event, in the NFL or in the football world, soccer as they call it there. It shouldn’t exist in any sport, period,’’ Kalou said.